The manipulator on the left is a traditional industrial robot and the one on the right is a cobot. Other than color, they look about the same. Which one is right for your application? Cobot or robot? Here are some considerations. • Is there a cobot that will do the job? Options of payload, geometry, etc. are very limited with cobots. Universal Robots has 3 cobot models and all are serial manipulators (3 kg - 10 kg). 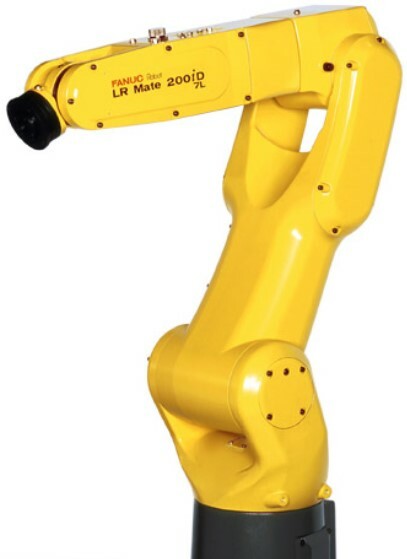 Fanuc has more than 100 traditional industrial robot models, including: serial and parallel manipulators, scara robots and delta robots (up to 2,300 kg). • Traditional robots are cheaper. A cobot is roughly 50% more expensive than the corresponding traditional robot. • The biggest drivers of this decision are generally around safety and specifically around safety fencing. I’m using the word fencing to generally mean any method that separates people from robots while they are working in the factory. Fencing describes physical barriers, but it also includes light curtains, cameras, mats, etc. The primary feature making a cobot a cobot is that people can potentially be in a cobot’s workspace while it is moving without violating safety standards. I use the word people to mean “regular people” on the factory floor. 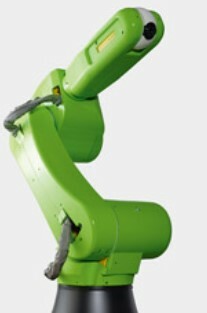 A technician in the process of programming a traditional industrial robot can be in the robot’s workspace while it is moving if it is in certain teaching modes. The design of fencing systems can be complex, but there are some rules of thumb that help frame the problem. For example, if a work piece can fly out of the work area and hurt someone in the vicinity, then there needs to be a physical fence. This can be point of operation fencing, like the door on a machine tool, or something like a fence around a work cell. Fences around work cells can take a lot of space, but they do simplify (at least conceptually) the machine guarding task. A fence around a work cell can guard a bunch of machines that all require point of operation guarding. • If there aren’t good reasons to have people in the robot’s workspace while it is moving, then a traditional industrial robot is almost certainly the better choice. Traditional industrial robots are less expensive and there are vastly more choices of sizes, shapes, features sets, etc. The only reason I might go with a cobot in this case is to keep my options open with regards to future tasks for the robot. This could be a reasonable consideration. I would expect cobots from the major manufacturers to last for years. They could be redeployed in a future task where they would use their cobot capabilities. Robot – If you decide to go with a traditional industrial robot, then I don’t have any more rules of thumb for you. There are so many different sizes, shapes, payloads, speeds, etc. available with traditional industrial robots, that I would have to see the application to give more guidance. On the other hand, I don’t see a lot of general differences between the major brands of traditional industrial robots. Fanuc, ABB and Yaskawa all make excellent systems. Cobot – If you decide to go with a cobot, then I see the options breaking down two ways. Either a cobot from a traditional robot company or a cobot from Universal Robots. • Product line - Breadth of product line from traditional companies. Spiders, big robots, small robots, etc. These are available now from traditional robot manufacturers, and I expect we will see more offered as cobots. UR has three cobots models, all of which are serial geometries. The biggest is the UR10e with a 10 kg payload. Fanuc offers the CR-35iA collaborative robot with a 35 kg payload. UR is not an option for applications that require more the 10 kg payload. • Eco-system – Advantage UR. Traditional companies will try to close this, but UR and their Eco-system grew together. UR has made it very easier to choose hardware and software that works with their cobots. They have also made it easier for developers to extend the UR software. This is not something the traditional robot manufacturers are comfortable with. If you are looking for cutting edge software, you are more likely to find it with UR. • Ease of use, Used to be with UR, but traditional robot companies are catching up. For example, I think the Smart pendant from Yaskawa is easier to use than UR's pendant. Mechanical - I created the table below to help understand the choice. It lists what I believe are the most important mechanical specifications for evaluating a robot. The reach, payload and repeatability numbers are taken straight from the specification sheets for each manipulator. I will also note that both companies measure repeatability to the industry standard ISO 9283, so I think this a fair comparison. My gut feel is that the cobots from the traditional manufacturers should have better mechanical performance. The specs seem to indicate this to be the case, but I would very much like to see an independent, side-by-side analysis of comparable manipulators performing the same variety of tasks. Nevertheless, here are some thoughts on the spec comparison in the table. • Warranty – Fanuc robots have twice the warranty because Fanuc doesn’t think you will ever use that warranty. Their designs have been honed over millions of hours of hard operation in the auto industry. If you follow the prescribed maintenance (which isn’t much), I would not expect anything to go wrong with the mechanicals of these cobots for ten years minimum. The UR cobots do not have that kind of track record. They have harmonic speed reducers, which don’t even need prescribed maintenance (a plus), but harmonic reducers are sensitive to shock (a minus). UR robots also have pretty quick delivery time for new arms & parts and a modular design for quicker repair (plusses). Availability is the important measure here. Availability accounts for both the time between failures (MTBF) and time to repair (MTTR). I do not see an advantage one way or the other with regards to availability. • Payload - Robots tend to get shaky when they get near their payload limits. They must move slowly (more slowly than required for safety) to let vibration modes settle down. All else being equal, I'll take headroom on the payload. That being said, I haven't notice the UR robots being "shakier" than their industrial robot brethren. • Repeatability - Many tasks may not "need" the better repeatability of the Fanuc robot, but my experience is that better repeatability of the manipulator makes everything it interacts with more forgiving. All else being equal, I'll take better repeatability. • Deployment cost - Various discounts and distributor/integrator arrangements make actual costs tough to pin down until you are getting quotes. My experience is that Universal Robots manipulators cost about the same as cobots from the traditional robot manufacturers. Deployment costs can vary widely. The closer you are to using the cobot "out of the box," the bigger the advantage to Universal Robots.